Sachin Tendulkar finally hits 100th international century after wait of 369 days and 33 matches; On the same day (16th March, 2012) Finance Minister Pranab Mukherjee has made Yorker of budget 2012-13 and clean bowled most of us with announcements. Many of us had expected a reform rich budget this year, with lot of expectation on reduction in inflation & tax burden, But Pranabda has again played different cards this time. 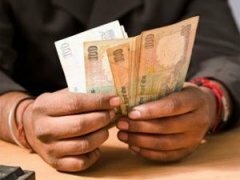 The first look on Indian Budget 2012 may gives the impression of a smart attempt but overall this budget cause increase in inflation and affect individual adversely. Let’s Review Union Budget 2012-13 & its impact on you in detail. Most of the people have demanded to increase tax exemption limit from1.80 Lac to 3 Lac in this budget, but tax limit was enhanced by only 20000 Rs/- for Male and 10000 Rs/- for female. Now new lax exemption limit for individual is 2 Lac. The differential tax slabs for men and women have been removed. We will check out details of these new tax slabs & how that will translate into extra savings for you for next fiscal or assessment year 2013-2014. With this new tax slab let’s look at your new income tax liability & your gain. 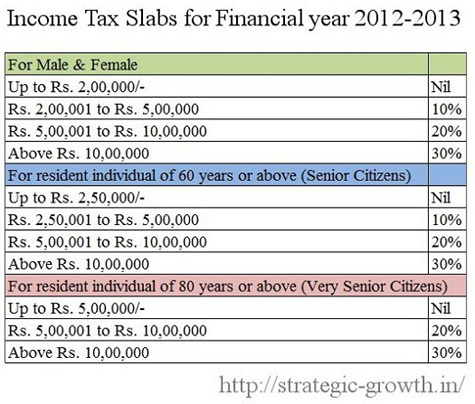 For individual who has income in range of 10% slab with this new tax slab change will save 2,060 Rs/- & individual in highest slab 30% will be able to save 22,600 Rs/-. 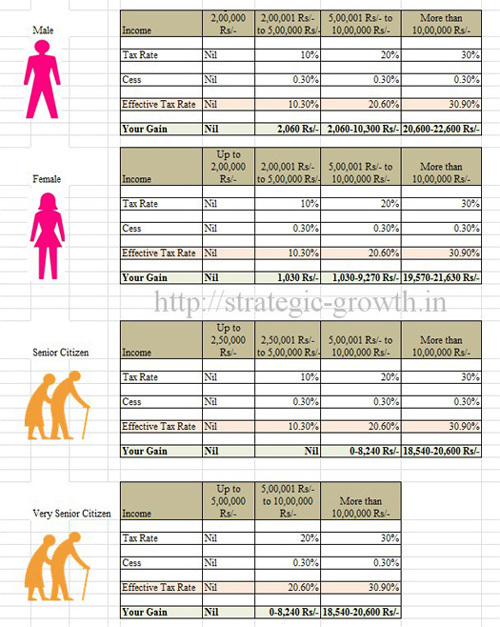 As differential tax slab for male and female is removed Female in lowest tax slab 10% will be able to save 1,030 Rs/-. Please refer to following table for detail gain and tax liabilities. In today’s situation value one thousand or two thousand rupee is nothing hence according to us this tax relief given by finance minister is negligible. Yes upper limit enhancement has given tax saving of 20,660 Rs/-. Basket of 80C qualify for deduction of 1 lakh remain unchanged, keeping same investment options open like PPF, EPF, Life insurance premium, NSC,ELSS, Tution Fees, Five year fix deposit, SCSS, Home loan principal payment and national pension scheme. Section 80 D basket is enhance by additional 5,000 Rs/- for amount paid on preventive health check-up of self or parents. Additional Deduction is given for interest up to Rs.10,000 from savings bank accounts. As you are aware that most of saving bank returns are less than 6% which will not beat even inflation so it is not carrying any meaning to keep amount in bank for earning small interest. Reduction of Security transaction Tax on delivery based sale and purchase of shares from 0.125 to 0.1 %. This will cause transaction cost to come down but according to us this reduction is negligible and only beneficial to long term investor or investor who deal in delivery base buying. Rajiv Gandhi Equity Saving Scheme to allow for income tax deduction of 50 per cent to new retail investors, who invest upto Rs 50,000 directly in equities your annual income should be less than 10 Lac. This according us is good step which may cause increase in interest of retail investor in equity market. IPO of 10 crore and above will only be in electronic form. This step will cause reduction in cost of issuing shares and opens door for more retail investor from tire 2 towns. With new tax proposal Service tax rate is raised from 10% to 12% hence most of the service we pursue we have to pay 2% more tax. Standard rate of excise duty is raised from 10% to 12%. Import duty on Gold is double 4% which will cause increase in import cost and reduction in demand. Disinvestment of PSU to raise fund up to Rs.30,000 crore. This step will cause boost in share market and retail investor will get chance to purchase PSU shares. Infusion of Rs.15,888 crore in public sector banks and financial institution cause bank to be equipped with growing competition. National Skill Development Fund allocated Rs.1,000 crore. This will cause improvement in skill and employability of people. Growth in 2012-13 estimated at 7.6 percent; expect inflation to be lower. So like every year this year also Finance minister has done his task of making Budget of 2012-13, Once again this budget has kept worry of common man aside. (1) Analysis of every now and then increasing price of Petrol, Diesel & Gas. If we consider previous year, price of petrol & gas was revised two to three times causing petrol price nearly 70 Rs/- Liter,Which was around 50 Rs/-. No analysis was given why this price has gone up and what is projection of price in next year. (2) Price of Milk was increased so many times in 2011-12 and reach to around 20 Rs/- per 500 ml. For so many of us this has caused major impact in household budget. (3) Edible oil Tin price was around 1400 Rs/- in 2011-12 but now it is about to reach 2000 Rs/- difference is only 600 Rs/- but for common man it may be unbearable. Nothing was mention about price rise in pervious or this year budget about this. (4) You might have observed so many vegetables like onion has shown so many time price rise and fall and common man could not understand how much to budget in household for vegetables (basic need). (5) Many Education institute still ask for donation,Still fees of education are increasing like anything which is going beyond reach of common man. (6) We have heard in budget that medicine will be cheaper this year but anyone has thought that every year we see rise of 10-15% on medical services for various surgeries and medical tests. (7) Real estate price is going up and up every year we see 10-25 % rise in price, reason was given that this rise is because of rise in raw material price but does government really take steps to control this price, so that common man can purchase his basic need. (8) Most of income tax contribution is coming from salaried people mostly all business person deals in black money & don’t contribute to income tax honestly,When government will make provision to kill this black money? I agree banti especially part written for common man desires.